We have reached the midpoint of the year, and top-performing funds are well on their way to earning FundGrade A+® Awards for 2018. And while this will not be the first award for many of the eventual winners, there is always a new crop of first-time winners that will get to take home the hardware. Here’s an early look at some of the likeliest first-time contenders. For some, this will be their first year of eligibility. Funds need two years of history to be included in the FundGrade calculation and a year’s worth of FundGrade ratings to be eligible for an A+ award. 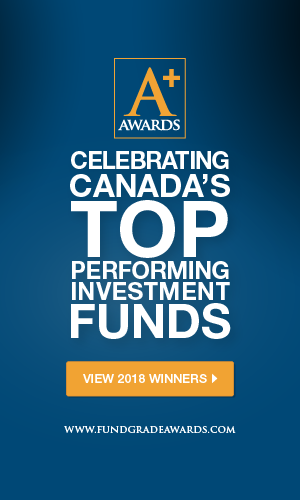 While for others, although they have been eligible for a number of years but unable to make the cut, their exceptional risk-adjusted performance has finally landed them in the upper echelon of Canadian investment funds. In either case, the following funds are on track to earn their first FundGrade A+ Awards, but will require a strong finish to the year in order seal the deal. BMO U.S. Dividend Fund debuted in November 2014. The fund is managed by Ernesto Ramos of BMO Asset Management Corp., who combines bottom-up fundamental analysis with a top-down macro strategy. The portfolio consists of U.S. dividend-paying equities that the manager believes are undervalued compared with their fundamentals. The current top holdings include names such as Microsoft Corp., Pfizer Inc., and Chevron Corp. Information Technology makes up the largest sector allocation at around 20%, followed by Financials and Health Care. BMO U.S. Dividend Fund narrowly missed out on the FundGrade A+ Award last year but is again looking to earn its first Award in 2018. Over 1 and 3 years, the fund is a first quartile performer with 12-month returns of 16.2% and a 3-year average annual compounded rate of return of 12.4%. But more importantly, the fund has managed to outperform while keeping volatility well below the category average. The average 3-year annualized standard deviation (SD) is just 9.9% compared with the group average of 11%. And over the past three years, the maximum drawdown is just 7.4%, while the average U.S. Equity fund is closer to 10%. This value-oriented, low-volatility style should bring comfort to investors who fear the bull market may be running out of steam. The fund is available in a variety of purchase options, with the Advisor series carrying an MER of 1.97%. For the past 10 years Dynamic European Equity Fund has dominated the European Equity category in outright performance. It has the highest 3-, 5-, and 10-year average annual compounded returns in the category at 11.0%, 14.0%, and 6.9%, respectively. But the highly volatile nature of this fund has kept it from maintaining a monthly A Grade, thus excluding it from the A+ Awards. This year, however, the magnitude of the outperformance is making up for the higher volatility numbers, and the fund is on pace to earn its first FundGrade A+ Award. Over the past two years this fund has posted an average annual compounded return of 23.3%, which 8 percentage points higher than its closest rival. And although its 2-year SD is one of the highest in the group at 11.1%, its Sharpe ratio is still 0.54, which is almost double the category average. The fund is managed by Benjamin Zhan and invests in businesses that stand to benefit from the “economic rationalization of the European markets.” Top holdings include Swatch Group Ltd., Burberry Group PLC, and LVMH Moët Hennessy Louis Vuitton SA. The highest geographic exposure is France at 24%. The next two highest are United Kingdom at 22% and Germany at 18%. Consumer Goods and Services make up close 50% of the sector allocation, with Technology next at 22%. An ETF looking to earn its first FundGrade A+ Award in its first year of eligibility is PowerShares FTSE RAFI Global Small-Mid Fundamental ETF CAD (TSX: PZW). The ETF was launched in April 2015 and has consistently performed at the top of its peer group. It has the second-highest 3-year average annual compounded return at 11.6% and fourth-highest 2-year annualized return at 19.1% in the Global Small Mid Cap Equity category. In addition, this fund is one of the least volatile funds in the group over the past three years. PZW invests in two underlying US-listed ETFs: PowerShares FTSE RAFI Developed Markets ex-US Small-Mid ETF (PDN) and PowerShares FTSE RAFI US 1500 Small Mid ETF (PRFZ). Each of the underlying ETFs tracks a rules-based indexes that focuses on book value, cash flow, sales, and dividends. Equities in the indices are ranked and weighted based on the fundamental strength of these measures. What you end up with is an extremely diverse portfolio of around 3,000 securities, made up of roughly 50% U.S. equities and 50% international equities. If you invest in U.S. dollars or if you are worried about currency exposure, a U.S. dollar version (PZW.U) and a CAD Hedged version (PZW.F), are also available. The MER of the main series is 0.62%. © 2018 by Fund Library. Brian Bridger, CFA, FRM, is Vice President, Analytics & Data at Fundata Canada Inc. and is a member of the Canadian Investment Funds Standards Committee. This information is not intended to provide specific personalized advice including, without limitation, investment, financial, legal, accounting or tax advice. No guarantee of performance is made or implied.